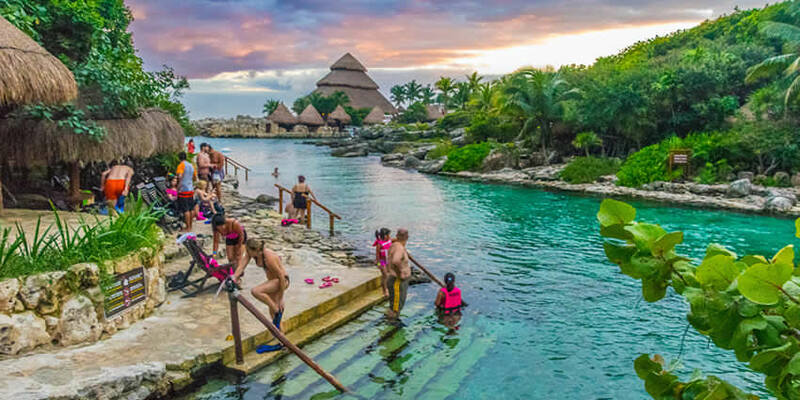 Xcaret Park is a privately owned and operated theme park, resort and self-described ecotourism development located in the Riviera Maya, a portion of the Caribbean coastline of Mexico’s state of Quintana Roo. It is situated approximately 75 kilometres (47 mi) south of Cancún, and 6.5 kilometres (4 mi) south of the nearest large settlement Playa del Carmen along Highway 307. It is named after the nearby archaeological site Xcaret, a settlement constructed by the pre-Columbian Maya some of whose structures lie within the boundaries of the park’s 81 hectares (200 acres) of land holdings. From 2010 to 2015, Xcaret Experiencias has been recognized as one of The Best Mexican Companies. Xcaret has attractions for everyone. Enjoy a traditional Fiesta Charra and the Mayan Ball Game, visit the Jaguar Island and our colorful Butterfly Pavillion, take a snorkeling tour, swim in underground rivers and have fun with the Dolphin Swim. When night falls, you will be the guest of honor at the presentation “Xcaret Mexico Espectacular”, a celebration of light and color with 300 artists that will take you through the history of Mexico. Cultural heritage and love for the environment await you in the best family theme park. The Ecological Park is built in the same area as the archaeological site and has the same name, Xcaret. The land was originally purchased by a group of Mexican entrepreneurs, led by architect Miguel Quintana Pali. 5 hectares of the land was purchased in 1984. When he began to clear the land, he started uncovering cenotes, sinkholes formed by collapsed cave ceilings weakened by 3 million years of erosion from underground rivers running through them and flowing into the sea. He saw the potential for tourism and formulated the idea of an Ecological Park open to the public, and soon joined forces with Oscar, Marcos and Carlos Constandse, achieving this goal in December 1990. At the same time, contact was established with the National Institute of Anthropology and History with the objective of rebuilding the remnants of the Mayan pyramids and buildings that were found in the area. The park’s administration subsidized all the operation and the INAH put in charge a team of specialists. The nature-based attractions of the park include a river that goes through the Mayan village, a subterranean concrete sluice in which people can swim and snorkel with a life vest. Near the inlet there are recreational activities at the beach, snorkeling, Sea Trek and Snuba in the nearby reefs, or swimming with dolphins. The park also has a coral reef aquarium turtle nesting site. Next to the inlet there’s an area for manatees. The park also has a bird pavilion, butterfly pavilion, bat cave, orchids and bromeliad greenhouse, an island of jaguars, and a deer shelter, among others. The cultural attractions include an open church, replica of a Mayan village with real artisans at work, a Mexican cemetery, a museum, an equestrian show, Mesoamerican ball game, an open theater with performances of pre-Hispanic dances, Papantla flying men and the Gran Tlachco (theater with a six thousand people capacity) where the Mesoamerican ball game is represented, as well as the meeting of two worlds, the Mayan and the Spanish, and the presentation of several Mexican folklore dances. Other demonstrations of Mexican traditions include Day of the Dead celebration and the “Travesía Sagrada Maya” (Mayan Sacred Crossing), an annual rite when Mayans would cross the sea from Xcaret and Playa del Carmen to Cozumel to pay homage to the lunar goddess Ix Chel. The modern version is a re-creation of this rite done in late May to early June. Playa del Carmen by taxi or bus. There is also aviable Tour Xcaret, the best luxury transportation service from your hotel. The easiest and safest way to get to Xcaret Park!